1. 42 slide ppt that walks through close reading of poems (listed below). Check out the preview for the style! 2. 12 question multiple choice quiz (that you can edit and pull from to incorporate into any assessment). Answer Key included! 3. PDF with a description of how I use this in my classroom, annotated poetry notes and the applicable common core standards. 4. To hook students, at the end of each poem, there is a clickable link to a popular song that has a similar theme. I play this song for the students and discuss similarities and differences. I usually do not play the video, just the audio in case there are any inappropriate advertisements or scenes. Students LOVE this part of the unit! I use this unit in my 12th grade British literature class along with an anthology, but all poems are readily available online and appropriate for most secondary English classes. 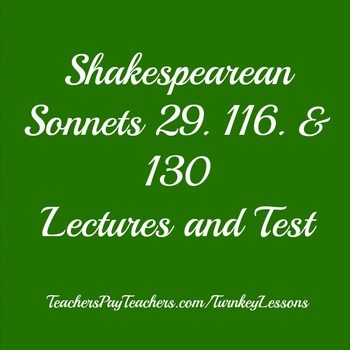 I also sell a whole Renaissance poetry unit with these poems along with sonnets from Sidney and Spenser plus the poetry of Marlowe and Raleigh with assessment for $15 if you are looking for a whole unit. Raleigh: "The Nymph's Reply to the Shepherd"
Please follow Turnkey Lessons here on TPT. Click here.